This is a photograph that was taken by a friend's son. Adam was working for a roofing outfit from Oskaloosa. He snapped this photograph with his camera phone. The story he told me was that they were hired to roof the house by the new owners. Holy smokes! That's amazing! If she weren't dead I would swear that was my great-grandma!. No surprise here. 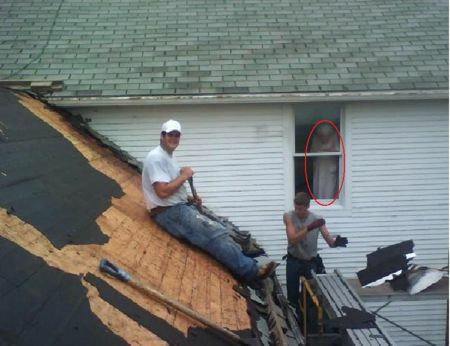 Home renovations always seem to disturb the spirits. A full bodied apparition, great photo !!!!. And you're sure no one was in that house? Are the windows long or is that ''ghost'' floating? That is scary!.